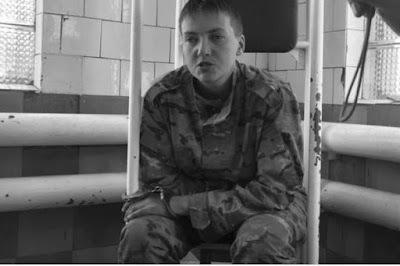 KIEV, Ukraine -- Ukraine is pressing for the European Union to impose sanctions on nearly 50 people it considers responsible for the "illegal detention and falsified trial" of Nadia Savchenko, a former Ukrainian military pilot and politician who is accused of killing two journalists in Russia. Ukraine is pressing for the European Union to impose sanctions on nearly 50 people it considers responsible for the "illegal detention and falsified trial" of Nadia Savchenko, a Ukrainian pilot accused in the killing of two Russian journalists in eastern Ukraine. She is awaiting the outcome of her trial. The list of 46 people, given by Ukrainian President Petro Poroshenko to the heads of the European Council and the European Commission in Brussels, includes 44 Russians and two Ukrainians. Officials said those on the list are "directly involved in the illegal process against the Ukrainian officer and pilot Nadia Savchenko, who is illegally kept in a Russian prison." Poroshenko urged EU leaders to act quickly against people who have played a role in Savchenko's case. Included on the list are Russian Investigative Committee Chief Aleksandr Bastrykin, Federal Security Service Director Aleksandr Bortnikov and Deputy Prosecutor-General Viktor Grin. Poroshenko said sanctions would be an "effective reaction against the brutal violation of international law and human rights." On March 9, members of the European Parliament sent a similar list to EU foreign-policy chief Federica Mogherin with recommending Russian President Vladimir Putin and 28 other officials be given sanctions. Putin spokesman Dmitry Peskov said Friday the Kremlin does not acknowledge any list of names and would not comment on it. "There is no 'Savchenko List,' let us proceed from that, thus there is nothing to say on this subject. There are no grounds for comments yet," Peskov said. Savchenko, 34, is a lieutenant in the Ukrainian army and an Iraq war veteran. She was the first woman to graduate from Ukraine's prestigious military aviation school in Kharkiv. She was fighting with the infantry in a volunteer militia when she was captured by pro-Russian forces on June 17. Weeks later, she was in a Russian jail. She is accused of killing Anton Voloshin and Igor Kornelyuk, journalists for Russia's state-owned VGTRK. They were killed in a mortar attack while reporting from the same battle where Savchenko was captured. Russian officials said she deliberately focused attacked on Voloshin and Kornelyuk. She has denied the claims and went on a hunger strike in protest of her detainment. The court is expected to read her verdict on March 21 or 22. Prosecutors asked for a sentence of 23 years in prison.